The new multi-functional lightweight bracket system for mounting any size independent twin cylinders. The modular unit may be used for multiple functions, ie. pony tank mounting, single tank adaptors, mounting rebreather cylinders. The bracket hosts a variety of mounting holes and slots for 2" webbing cam bands to mount almost any configuration in any manner. The system is manufactured from marine grade aluminium, anodised in silver and is light in weight making it an ideal travel companion. You may purchase these brackets in various formats, please see item list below and chose your selection from the drop down menu below. 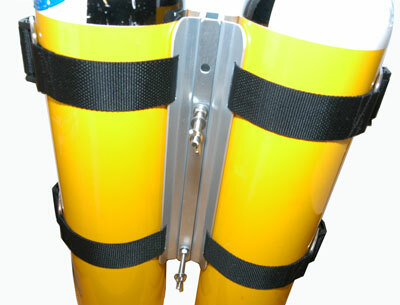 All parts may be purchased separately, please contact Custom Divers for pricing. Please note the tank/cam bands shown in the pictures above are for illustration and are not included with the brackets, we stock three different sizes of bands. 3, 7 or 10 to 18 ltr cylinders which may purchased separately. Click here for tank/cam bands. For more pictures click on the data sheet.